Everyone loves lists, right? I'm pretty sure there are entire websites built on that concept. Well, we love lists too, and so it's time to go over our Top Ten Products of 2016! Like every year, the list is devised using margin dollars, so the list isn't all car parts, glue, and paint — and while the words accompanying the products are opinion, how they placed isn't something we change. What follows are the Top Ten Products we sold this year. The Traxxas Rustler has never been on this list before. It's a truck that was, for a time, lost in the short course hustle and bustle caused by the Slash. The Rustler sat, underappreciated, for nearly a decade, ready for the world to notice it again. When Traxxas lowered prices across the baord last year, the Rustler finally got a chance to shine again, and now it's made it onto our Top Ten list for the first time! Chargers like the KX80 will probably always be on our list. This year saw the KX80 tumble down the list, largely due to another charger that really shined bright in 2016. Regardless, the KX80 is a staple in our store, being the most versatile single-port charger we carry. Whether you fly planes, run cars, or float boats, the KX80 can be the charger for you. 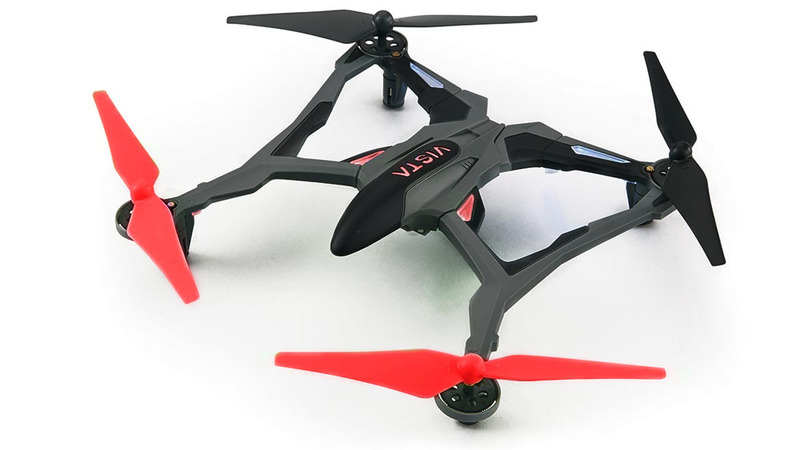 Coming in eighth place, the Vista FPV is a fun and durable drone. It's included camera is capable of beaming the video straight to your smartphone, so you can see what it sees — great for lining up the perfect picture. Drones may have taken a beating this year, but the Vista FPV proved that drones are still popular enough to make the list. The popularity of the Slash 4x4 Ultimate wanned over the year. It started off strong, but as other, more expensive trucks grew in popularity, the Ultimate couldn't keep up. That said, it's still a tremendous value, and obviously still did well enough to appear on our Top Ten list for the second year in a row. When it comes to bang for your buck, there's no better choice than the Slash 4x4 Ultimate. The X-Maxx debuts on our list in sixth place! It was a force to be reckoned with in 2016. Sales were, much like the truck itself, quite large — we sold more than twenty of these big beasts this year, and with a price tag of $800, that came as a shock to us. While a few other Traxxas trucks beat the X-Maxx this year, it's likely we'll see the X-Maxx back on the list next year — and maybe even higher on the list! The Stampede has been on this list before, never placing higher than fifth. Unfortunately, this year is no different. Still, The Stampede is a huge part of our store's R/C line-up, being the best non-Slash beginner-focused truck we carry. It's amazing; with as modern-looking as the Stampede is, it's hard to believe this truck came out in 1994 — and is still selling strong today. Debuting at number four on our list is the Traxxas EZ-Peak+ Charger. at only $50, the charger came on strong this year against competitors like the KX80, and in the end, outsold all other chargers by a long margin. 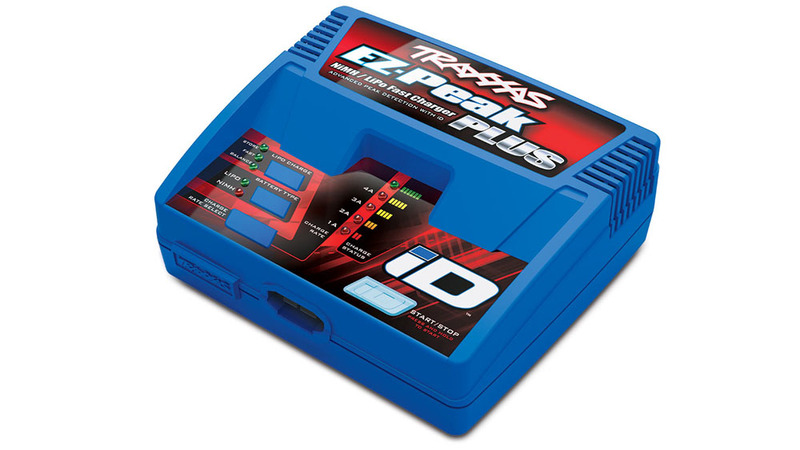 The EZ-Peak+ is easy to use, and with Traxxas' ID battery system, even LiPos are simple to take care of. While I'm not a fan of Traxxas keeping the ID tech proprietary, that shouldn't diminish the success the EZ-Peak + had this year. The E-Revo is a relative newcomer to our Top Ten List, placing seventh in its first appearance last year. The intervening year saw the E-Revo rise in popularity as its price dropped — probably a result of the X-Maxx being released. The E-Revo is possibly the most capable vehicle we carry, conquering any terrain with ease. It's also the most popular truck with our staff, with three of us owning the truck personally. Hard to get a better testimonial than that. A mainstay on our Top Ten Lists every year since we started, the Slash 4x4 is a great truck for anyone, regardless of experience level. It's tough, agile, easy to work on, and upgrades are plentiful. There's just no questioning the popularity of the four-wheel-drive version of the Slash. It's hard to imagine a Top Ten list without this venerable truck somewhere within. It's not a surprise to see the Slash 2WD at the top of our list. We sold more than 130 of these trucks in 2016. With those kind of numbers, it's not hard to see why the Slash 2WD is consistently on our Top Ten list — in fact, since we started doing these lists in 2012, this truck has been on the chart from the start. As you've seen, it's been a Traxxas kind of year for us, with eight out of the ten items coming from the titanic truck-maker. While the items on the list are interesting, I think it's even more interesting to take note of what didn't make the list in 2016. Despite topping our list last year, Dromida Vista sales fell flat this year. It's not the product's fault — it's still the same great quadcopter it was last year — but the market, and the competition the Vista faced, changed. In an industry where the only constant is change, the Vista failed to adapt. It's price remains the same as when it was released, yet mass market stores carry drones for half the price, and while they might not be as good as the Vista, their availability and affordability make them opponents even so. Hopefully the Vista can make a comeback next year. Another item that is surprisingly AWOL is the venerable 5000mAh 2S LiPo battery packs. They've been on the list for years, ever since we started keeping track of these lists. They ended up just getting shut out by the Rustler for the tenth spot, and this really showcases just how hard it is to get on this list — and how easy it is to get knocked off it. Another list mainstay for the last couple of years is the gimbal-equipped camera drone, and it is absent as well. The Chroma, despite being a great seller and a stellar product, was discontinued by Horizon Hobby this year. While drone sales in general are down, as we discussed in both our Look Back at 2016 article and the Top Hits and Misses of 2016, it's disappointing that product on our Top Ten list for the last two years won't be gracing our shelves again. 2016 was a long year. With it now behind us, and 2017 full of potential and promise, the question remains: what will make the list next year? What new product or innovation will shake up the status quo? We'll have to wait and see what makes next year's Top Ten Products! A Critical Look: End of an Era?